Three nuclear submarines of the Russian Navy currently under maintenance will be recommissioned by 2014, a Navy spokesman said. The K-410 Smolensk cruise missile submarine, which is undergoing repairs since 2011, will resume its service in the Northern Fleet, the spokesman said Tuesday. The Pacific Fleet will be rejoined by the K-150 Tomsk cruise missile submarine, which was docked in 2010 due to problems with the cooling engine of its nuclear reactor; and the K-419 Kuzbass attack submarine, under repairs since 2010. 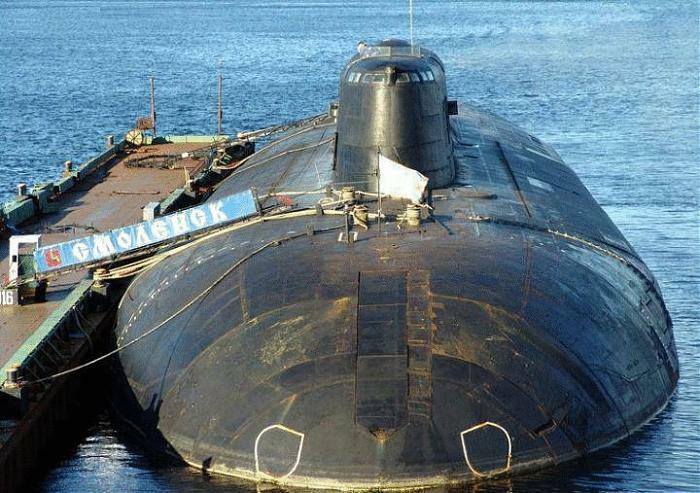 The Kuzbass belongs to the same Akula II class as the ill-fated K-152 Nerpa, on which 20 people were killed during sea trials in 2008 due to malfunction of the fire suppression system. The Russian Navy has 48 nuclear submarines, 20 of which are currently undergoing repairs or upgrade, according to Russian-ships.info database. This entry was posted in The world's submarines and tagged Akula II, K-410, K-419, K150, Kuzbass, Russia, Smolensk, Tomsk on May 1, 2013 by jasonlockley. HOLY COW!, That there is one big bloated submarine. I imagine that this is what a US submarine might look like if it were a a dead cow that had been left in the sun to “bloat”.